I know sounds silly but this is one of those products you have to feel to believe! When I was first approached by Heat by Design I said nah, this can't work. I very RARELY ask for products to test out since I know it is costly for the manufacturer and I typically do not write reviews - but I had to see this to believe it! So, here is what I think. What is it? It is a stunning picture frame with YOUR image that is also a heater! Yep, you heard me right....a Photo Heater! When I opened the rather large box - (I knew it was big, but didn't realize how big), I pulled out one amazing image! The quality of the print for the size it is -¬† is incredible, the colors are vibrant and the frame is a classic black which will fit into any decor.¬† I did take a¬† picture, but please excuse the poor quality my house is not meant for picture taking, too dark, but it gives you an idea! 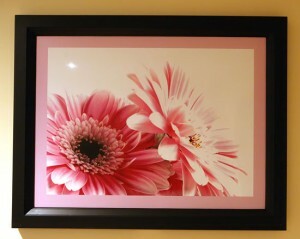 The picture I received has 2¬† beautiful pink flowers and I cannot say enough about how great the print is - it has a little heating unit in the back of the frame where you plug in one end of the electrical cord and they even did a great job of giving you "hooks" to hide as much of the cord as you need to right in the back of the frame. It is the beauty of being able to print your own image that makes this truly special, and if you want to get one - just Click Here and it will take you directly to the custom photo ordering page. Once you plug the cord into the wall a tiny dot will light up on the front of the frame - just letting you know it is ready to roll. You simply glide a finger over the "sensor" to turn the unit on or off. The frame came with a wire in the back so it was ready to hang - great for the not so handy like me! I have had it running for the last few days and can tell you it does a GREAT job of throwing off heat! I used it in a bigger room than what they recommend but it still helped give it that extra bit of warmth that has been needed these last few freezing cold days! In a smaller room I am sure this would be a cost effective way to get some extra heat! Frame measures approximately 36" x 28"
Picture size is approximately 28" x 20"
My only suggestion to the gang at Heat By Design is to make their website a little "warmer"! I know they deal with a technology product and offer products to commercial as well as residential, but I do find the site a little intimidating to order from....it looks too commercial for the warm product they are offering - but again my opinion! I truly love this product. I believe it is one of the most innovative ideas yet in the world of photography! I love the concept, the appearance, the way it works....the only thing I hope is that they will come out with a table top version for those cozy nights reading a book in my favorite chair!